Lundby has a new dollhouse called the "Gotland" coming out this year. The Gotland appears to be a small modern dollhouse with great acrylic double doors, windows and a functional skylight. 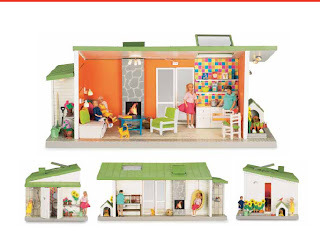 Anyone know more about this latest Lundby dollhouse product? I have written Lundby/Micki for more information and images. When/if they respond, I will update this post. The nice folks at Micki let me know that this dollhouse will not be sold in the U.S. They are sending me a catalogue with Gotland dollhouse images. I'll scan and post the images when it arrives. The Gotland has five play areas—including a dual-sided fireplace, cool porch swing, a vegetable garden and an outdoor bathroom (Love the outdoor shower but the structure with the toilet and sink remind me of an outhouse--Ha ha!). This dollhouse is designed by the same duo who designed the modern 2005 Stockholm dollhouse—Ann Morsing and Beban Nord of Box Design. If you live in the United States, you will be able to get this dollhouse from The Shopping Sherpa and Cheeky Monkey Toys. Not in the U.S.? What a tragedy! It;s such a nice size ... perfect for my cramped apartment. I am new to this dollhouse topic so fairly ignorant on a lot of things ... are Lundby dollhouses all 1:18? Boohoohoo. I wish they were 1:12 ... imagine the crossover fun. Lundy dolls´ houses are less exprensive to buy from sweden directly. Google on the words Lundby dockskåp Gotland and you will find some online toy stores (www.lekmer.se) Or ask a swedish friend to buy a house for you and send it to you. For anybody interested. They are available in the US from at Cheeky Monkey Toys. I just received mine. Shipped from California. I paid $127.99 USD and the shipping was free. It is a joy with new features and many, many outlets. It took me three full hours to assemble and now all the fun is mine to share.